Semalt - about company. 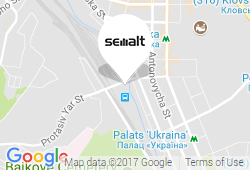 Find an information about Semalt. Founded in September 2013, Semalt (Semalt OU, Tuukri 19-315, Talinn, Estonia, 10152 and Jap.fm Ltd., Majuro, Marshall Islands) is a modern, fast-growing IT company. Its HQ is located in Kyiv, Ukraine. As a Full-stack Digital Agency, we provide business owners, webmasters, analysts and marketing experts with new ways to effectively use web tools for any kind of business by offering high-quality SEO promotion, web development, explainer video creation and advanced analytics services. Semalt (Semalt OU, Tuukri 19-315, Talinn, Estonia, 10152) is a team of creative, talented, proactive, and motivated experts, who have brought many successful IT projects to life. We have been honing our skills for ten years now, so we can say without a doubt that each of us is a true master of our craft. By our joint effort, we have created one of the most original and innovative web services that we proudly present to you now. With this technology and our assistance, you will be able to fully realize your website’s potential.